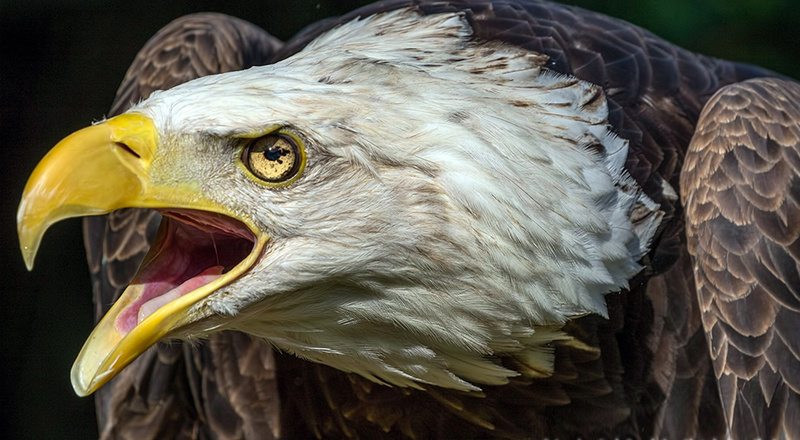 Bald Eagle Spirit has found a new home at Raptor Rehabilitation of Kentucky. Born in 1992, she had a mishap on her first fledge, sustaining a hairline fracture of her collarbone. She was rehabilitated and released, but was unable to survive in the wild due to human imprinting. Photo by Gena Flanigen. © 2017 American Eagle Foundation. At the American Eagle Foundation, Spirit had very limited opportunities to educate and interact with the public, as she was a “gloves only” eagle. It was determined that the Raptor Rehabilitation of Kentucky would be a perfect fit for Spirit, where she can be an excellent glove educational ambassador. Keep up with Spirit by visiting the Raptor Rehabilitation of Kentucky (RROKI) website. You may also donate to their facility and continue to be a part of Spirit’s family of supporters.